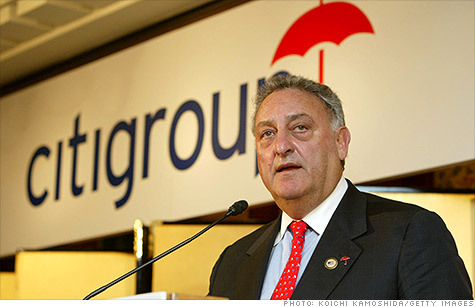 Sandy Weill, shown here in a 2002 photo as chairman of Citigroup, says big banks should be broken up. NEW YORK (CNNMoney) -- The man responsible for creating Citigroup -- the world's first financial supermarket -- said Wednesday that the nation's largest banks should be broken up in order to protect taxpayers. Former Citigroup chairman Sandy Weill -- who engineered a series of corporate takeovers and lobbying efforts to create Citigroup -- explained during an interview on CNBC why he now thinks a firewall between commercial and investment banks is needed. "What we should probably do is go and split up investment banking from banking," Weill said. "Have banks do something that's not going to risk the taxpayer dollars, that's not too big to fail." Weill's call to break up the nation's largest banks comes a little more than a decade after he helped orchestrate the merger of Travelers Group and Citicorp, a deal that created what was the world's largest financial services company. The deal was not have been possible with Glass-Steagall, a Depression-era law that prevented commercial banks from dabbling in investment banking, on the books. But after intense lobbying by Weill and his associates, Congress repealed the act in 1999. Some critics argue that its demise paved the way for deposit-taking banks to make colossal bad bets, while bank traders chased profits and big bonuses. Citigroup, where Weill would serve as chairman until 2006, would eventually receive taxpayer-funded bailouts during the financial crisis. On Wednesday, Weill attributed many of the problems faced by banks in the run-up to the financial crisis to over-leveraging and a lack of transparency. The end result, he said, is a banking system that now lacks innovation and is distrusted by the public. "There is such a feeling among people, among regulators, among the political system all over the world, against the banking system, and I don't think that's going to change so soon," Weill said. Weill said he hasn't discussed his views with current Citigroup (C, Fortune 500) CEO Vikram Pandit or JPMorgan's (JPM, Fortune 500) Jamie Dimon. The comments from Weill, who also served on New York Fed Board of Governors, indicate a remarkable evolution in his thoughts on the risks posed by large financial institutions. The New York Times has reported that as recently as 2010, Weill had a 4-foot wide portrait of himself hanging in his office that was etched with the words "The Shatterer of Glass-Steagall." But on Wednesday, Weill said that current conditions demand something new. "Well, you know I think the world changes, and the world that we live in now is different than the world we lived in 10 years ago," Weill said.